July 12, 2010 by Venky. 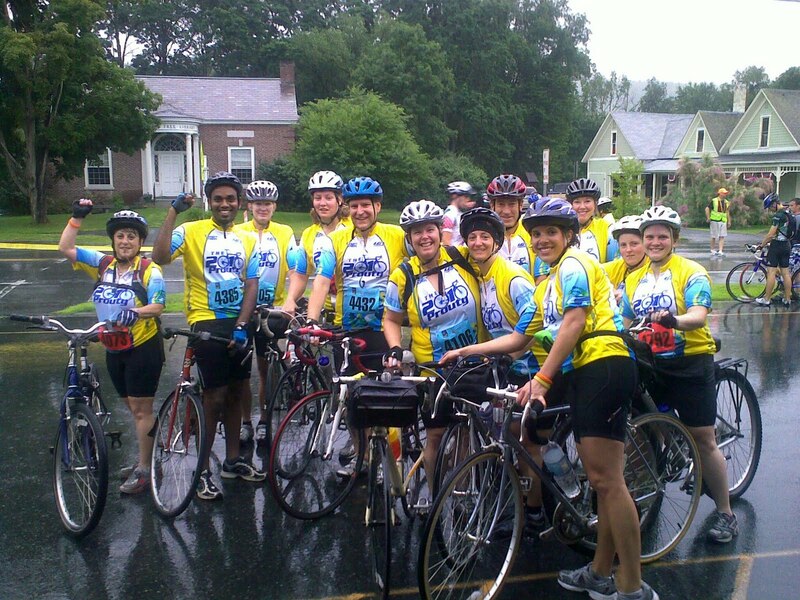 The ride starts in Richmond Middle School in Hanover Saturday morning. So, we decided to spend Friday night camping in Quechee Camping Ground KOA. That would mean we can be at the starting point quite early. After we assembled at the camp, we visited the school to register, collect our bibs and have our pasta dinner. Later at the camp site, we had a great time. We baked marsh mellows on the camp fire and ate them with chocolate. It was one of many first time experiences for me. For once, Eric’s simile describing them as ‘happiness on a stick’ felt accurate. It was fun sitting around the camp fire and sharing stories before we made our way into our respective tents retiring for the day. A barrage of rain drops playing drums on the tent woke me up. I didn’t know when the orchestra started but the watch read 4:55am. After a quick check to ensure that the water did not make its way into the tent, I got out of the tent to get ready for the ride. One by one everyone woke up, freshened up and changed into the team’s cycling attire. The rain did not stop and showed no signs of relenting any time soon. So, we decided to make our way to the starting point of the ride after a quick breakfast of Muffins, Bagels and cheese and hot coffee. The event had different categories in terms of distance both for walkers and cyclists. 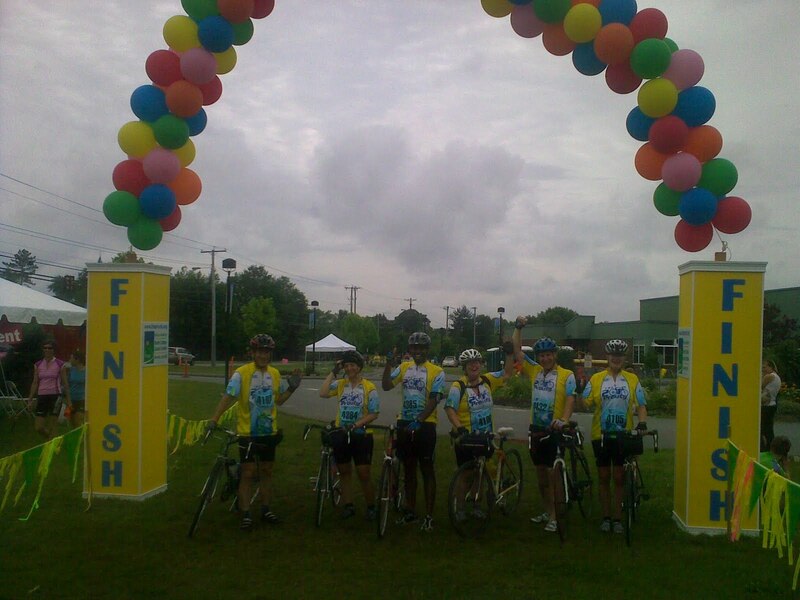 Some of our team members were riding 35miles while some were riding 50 and 100miles. The number of people turning up even in pouring rain was amazing. It was as if everyone was thanking the rain gods for blessing them with cooler weather. It was completely opposite to the sweltering heat of the last week. I think we’d have picked rain over sweltering heat on any ride day. We just had to be a bit watchful and not go too fast. At the first two SAG stops around the 10mile and 20mile marks we waited for everyone in the team to arrive cheering and encouraging the riders. After that the routes for 35 and 50miles looped back. Karly Bresset, Cyndy Cross, Judy Emmons, Sara Matthews, Denise Sullivan, Elizabeth McCarthy head out on their respective routes. Ann O’Day started out on ahead of the team along with another friend. The remaining six of us, Rob Levasseur, Kim Potter, Jan Prive, Donna Morgan, Eric McCarthy and I, headed out on our 100mile route. 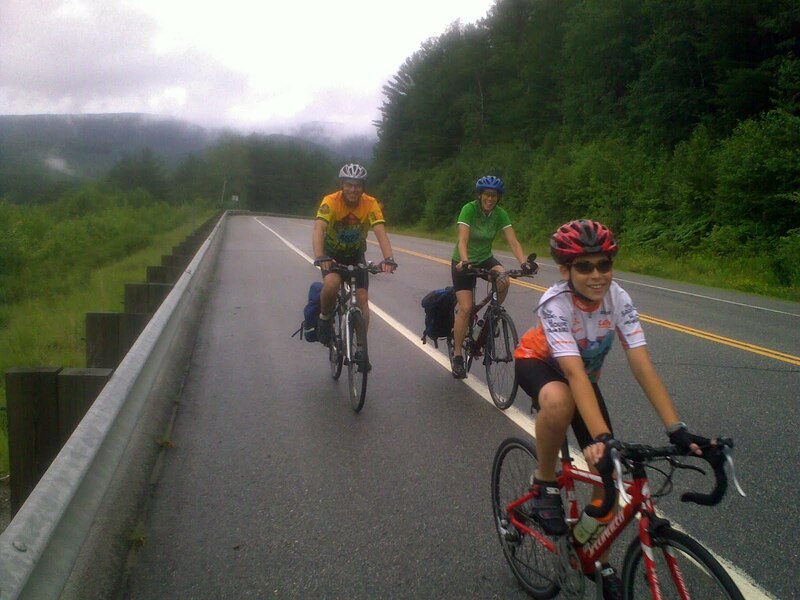 The rain continued, keeping us blissfully cool as we cranked up the little hills on the route. The third SAG was on the top of Mt Cube which was the highest point in terms of elevation. All the climbing in our practice rides came in really handy and none of us really felt that the hills on the route, including Mt Cube, were hard to handle. Even on my fixed gear bike, I hardly had to get off the saddle to handle them. The rain washed and fog covered scenic beauty on the route was breathtaking to say the least. As we approached the halfway point, I rode past a small group of riders. A closer look told me that they were a couple riding along with their son. I could not believe that the kid was riding the 100mile course. He was just 10years old. I was amazed by the smile on his face as he rode at a quick clip. Later at a SAG stop, I came to know that it was his second century and that last year was his first. He started riding on the Prouty charity ride as a 3year old riding in a trailer as his parents pedaled. Then at age 7, he participated on the 50mile ride followed by 75miles the next year. At age 9 he completed his first 100mile ride. So, for me, he is a veteran rider. It has not even been two years since I started cycling and this is only my first 100miler. He is an amazing kid with amazing parents who clearly lead by example. Kudos! At around noon the rain stopped but thankfully, the skies remained overcast. To say that the charity ride, as an event, was well organized would be an understatement. There were scores of volunteers providing directions, serving at the SAG stops, providing mechanical support tuning up the bikes, going around in support vans and patrolling the course to ensuring they would be available if someone needs them. The SAG stops provided fresh fruit like watermelon, oranges and bananas. Peanut butter and jam sandwiches were on offer along with various cliff bars, Gatorade and water. Along the course, looking at riders of various ages (10years to well over the 70s) and fitness levels taking on the challenge and in the process contributing to such an important cause(research to find cure to cancer) was truly inspiring. We kept ourselves hydrated and refueled through out and made steady progress cranking way mile after mile. We saw the sign ‘1 mile to the Finish line’ and slowly started climbing the last hill before the finish. Suddenly the chain on Kim’s bike decided that it had enough and got out of the crank and refused to move. The clips on her shoe refused to come out of pedals as they wanted to get the ordeal done and over with. In slow-motion, poor Kim leaned sideways on to Jan who intern leaned on to Rob who took refuge by leaning on to the road side guard rail. The scene was reminiscent of the Tour-de-France peloton crash. Thankfully, no one was hurt. True to her style, Kim rounded off the ride with a memorable incident. We posed triumphantly at the finish line and enjoyed our post ride dinner before making our way back to the campsite and eventually back home. It was a perfect day both in terms of weather and the ride itself. Previous Sunny Skies And Blown Tires..
How does a 100 mile ride in US compare to a 100 km ride in India? Since you did both, you might compare. Is riding on US roads anymore easier?